Rugged and waterproof (IPX-7), the eXplorist 610 combines high sensitivity GPS reception with easy to read mapping and accurate navigation. Find your way using more than 30 navigational data fields. Create waypoints, record tracks, and route from point to point. The integrated 3.2 mega-pixel camera, microphone, and speaker enable outdoor enthusiasts to record geo-referenced images and voice notes. Relive your outdoor adventures on the device, on your computer, or share with others on various online communities. 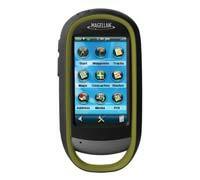 The eXplorist 610 combines high sensitivity GPS reception with easy to read mapping and accurate navigation. Click to enlarge. The eXplorist 610 packs the most accurate maps into the palm of your hand. The World Edition map allows for 2D or 3D viewing angles. It includes a complete road network in United States, Canada, Western Europe, and Australia and major roads throughout the rest of the world and provides cartographic orientation in almost any location. This unique, preloaded map also includes water features, urban and rural land use, and a realistic shaded relief background. The eXplorist 610 also includes Summit Series, a highly detailed topographic map based on 1:24,000 scale source maps. The map includes contour lines, land use areas, trails, waterways, and points of interest. Locate the nearest trailhead. Search for the nearest bike shops, fuel stations, or potable water source. Navigate safely in 3D perspective view while knowing the boundaries between private and public lands. The best of both worlds, the eXplorist 610 combines the user friendliness of a touch screen with the reliability of two customizable hard buttons. Program the hard buttons to your two favorite or most used functions. Powered by two AA batteries, the eXplorist 610 will last up to 15 hours under normal conditions. To help conserve power, use the suspend mode to turn off the device but maintain GPS tracking. You can also adjust power management settings to your preference. Magellan's award winning OneTouch favorites menu is now on our handheld devices. It provides instant access to bookmarks of favorite places. Set your home, base camp, and car. Easily re-assign a new location for each new adventure. 12 customizable icons to create personalized searches, save unique locations, or assign quick access to your favorite screens. Take photographs along your journey and reference the location where each photograph was taken afterward. Use the Integrated Microphone and Speaker to Record voice memos and playback in the field! All multimedia content can be geo-tagged with coordinates or attached to waypoints. The World Edition includes a detailed road network, water features, urban and rural land use, and a realistic shaded relief background. Summit Series USA is highly detailed topographic map based on 1:24,000 scale source maps. The map includes contour lines, land use areas, trails, waterways, and points of interest. Locate the nearest trailhead. Search nearest bike shops, fuel stations, or potable water source. Navigate safely in 3D perspective view while knowing the boundaries between private and public lands. An intuitive touch screen user interface and sunlight readable screen makes the eXplorist easy-to-use in almost any environment. The eXplorist GPS receiver supports GPX file format and connects seamlessly to a PC as an external drive. Simply save files to and from the device and share with your favorite online communities. Always know exactly where you are going, which direction is north, and your accurate altitude about sea level with built-in sensors. Know the direction to the geocache while standing still. Measure barometric pressure over time to track changing weather conditions. Use a number of different digital compass' to always understand your cardinal directions. Magellan's OneTouch favorites menu provides instant access to bookmarks of favorite places, personalized searches, and quick access to your favorite screens. Powered by two AA batteries, the eXplorist GPS receiver will last up to 16 hours under normal conditions. To help conserve power, use the suspend mode to turn off the device but maintain GPS tracking. The eXplorist GPS Receiver is submersible and tested to IPX-7 standards, which means it can withstand depths up to 1-meter for a total of 30 minutes. The integrated SiRFStarIII GPS chipset provides up to 3 meters accuracy with the assistance of WAAS, EGNOS, and MSAS to provide the most accurate location information worldwide. Magellan eXplorist 610 GPS Receiver, Standard Mini USB Cable, Quick Start Guide, 2 AA Batteries, Geocaching.com 30 Day Free Trial Flyer, Energizer Battery Coupon. Features Dedicated geocaching device that comes with features beginner or advance geocachers will appreciate. A solid device with all the basic navigation you’ll need to get to your campsite and back. Customize your device with your own map content from Nat Geo, Navionics, Fishing Hot Spots and more. Capture and share your adventures with the built in camera and microphone. Shoot stills and video, with geotagging and voice annotations. Increase safety and precision with additional sensors, elevation and barometric altimeter to predict weather conditions. The ultimate navigation tool with the ability to get you from your doorstep to summit and back again.